Well, THAT was quite the January! Enough snow and below zero stretches to cause real concern for our girls out there in the cold. Finally after weeks of this deep freeze, we may get some sunshine and perhaps even have the girls get some cleansing flights in. 4- the hive preparation (protection from wind, moisture buildup management etc). What can you do for them now? When the weather does permit, heft the back of your hive to access weight of remaining honey stores. When we have an over 50 degree day, you may open the hive to add honey frames, or move outside honey frames closer to the cluster area if needed. However, only open the hive if you suspect starvation is a possibility. If you don’t have honey, you may add fondant. Never feed syrup during the winter months, even if the weather turns warmer for a few days. The girls can’t turn it into honey in cold weather, and it only brings moisture and possible dysentery. Unless you suspect a food storage deficiency, it is best to not open or disrupt the hive. The size of the winter cluster reflects the external temperature. A four frame cluster’s diameter will go from 15 inches at 5 degrees, down to about 10 inches in -4 degrees, and amazingly 4 inches at -26 degrees. Most colonies have consumed all of the honey in the lower hive body, and are now up near the upper hive body. This makes it easy to feed them should the need arise. Clearing the bottom entrance of dead bees is a good idea. Their soggy wet bodies do no good clogging up the exit. Make sure lids are on top and not blown off, or the hive has not become lopsided or worse due to moist dirt giving way underneath (I have had gopher holes collapse under my hives when the ground got moist, and almost toppled over my hive!). Now though, is a good time to re-evaluate winter hive location. If your hive could have received better sunlight in an adjusted location rather than where it presently is, keep note of that for your next hive, or perhaps scooting your present hive to a better location once the summer comes along. Now is also a good time also to research how to do a mite count, or review your choices for mite treatment for the spring. It’s also time to put in your orders for bees, and to dreamily browse through bee journals, magazines and books. We, like our girls, can enjoy a little down time before the explosive energy of Spring and Summer starts us rocketing forward in bee activity once again. Soon, we will get our first sting of the year! I can’t WAIT!!!!! 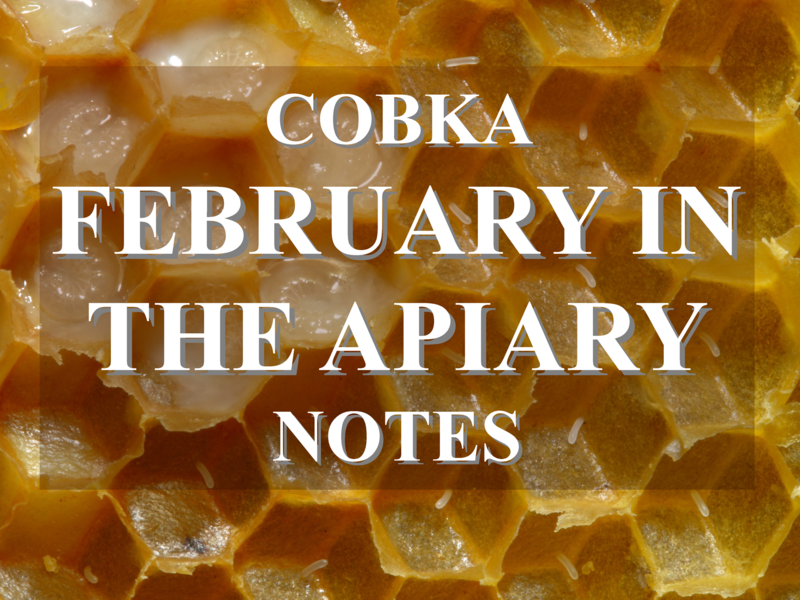 Many thanks to Kim from Backyard Bees of Bend for these February notes! !